Whole30 fail. I just ate some hollandaise sauce…. So breakfast this morning was out with some workmates before the daily grind. The new gastro-pub down the road was offering FREE breakfast as a promotion for their kitchen opening. The breakfast menu was somewhat limited – lots of bread, gluten-ified fritters, bircher muesli, etc – not paleo friendly. Beacuase of the free offer you were not allowed to modify the menu options, so I settled for poached eggs with ham, potato hash and hollandaise. I asked if the hash was flour fee (which it was), but failed to think about what it might be fried in – it was deep fried so I assumed vege oil and quickly moved to the side of the plate. I asked for the hollandaise on the side (thinking I would leave it on the side) but my meal came with the sauce on the eggs AND an extra side – damn! So I scrapped of what I could and went ahead and ate my meal. And you know what? It really wasn’t that good. Afterwards I had an overly full sinking feeling in my tummy…. boo. The funny thing is I would have thought my first slip would be sugar. But sneaky butter made it in instead. The rest of the day was perfectly paleo; tuna and avocado salad for lunch; an apple for a snack this afternoon (fully conscious that I am propping my afternoon snack habit up with apples – must cut the leash here); and lamb roast for dinner. Yes that’s right, lamb roast on a school night! 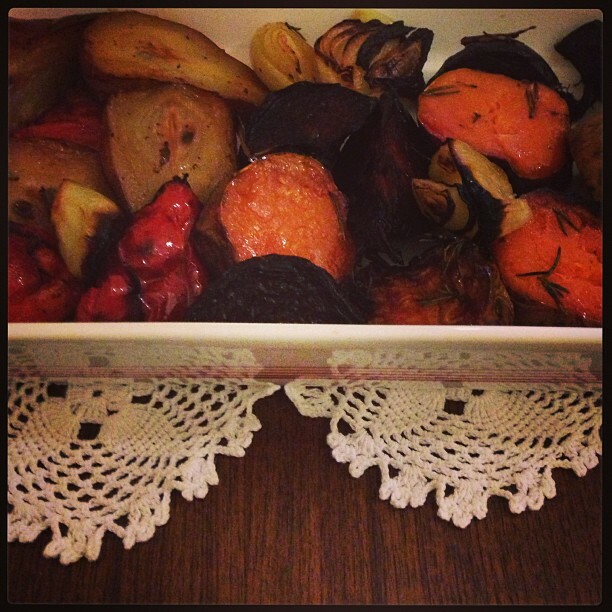 My mum flew in from out of town and prepared a whole roast lamb leg with roast sweet potato, beets, capsicum, onion and pear – pretty amazing! Previous Post Whole30 – Day 9: Biggest Loser! Next Post Whole30 – Day 11: paleo restrictive? Well done on managing eating out. It’s not a fail, it’s a feedback wheather you decide to restart or not. Main thing is that you went back to compliant eating right away. This is huge!